Two significant events in Germany’s lead-up to World War II are discussed in the 2017 Prix Goncourt winning novel ‘The Order of the Day’ which is probably as close to non-fiction as a work of fiction can ever be. The events in the novel really happened, and the characters were all real people. Nothing is made up. In fact the novel strives to be entirely historically accurate. The only reason ‘The Order of the Day’ could be classified as fiction is that the author Eric Vuillard recreates private conversations that we know took place but do not know exactly what was discussed. The first event is a meeting of twenty-four major German business owners on February 20, 1933 where they all agreed to lend their support to Adolf Hitler. These were the Krupps, the von Siemens, the Opels, and others. Just as we are settling in for an account of this horrific meeting, Vuillard switches his focus to another significant event leading up to World War II, Germany’s annexation of Austria which is now known as the Anschluss on March 12, 1938. First there is a calling into account of English diplomat Lord Halifax who along with Neville Chamberlain were architects of England’s appeasement policy toward Hitler and Germany. Lord Halifax caving to the Nazis reminds me of the attempts by politicians and diplomats to appease and placate Donald Trump and Vladimir Putin. Then we proceed to the futile attempts by the leaders of Austria to keep its national integrity despite the German onslaught. On the day of the takeover of Austria, Hitler ordered a tank invasion – a Blitzkrieg – of Austria. However some of the heavy artillery vehicles stalled in the middle of the road. An entire line of German tanks sat motionless. What was supposed to be Hitler’s triumphant return in a Blitzkrieg to his hometown and the towns where he spent his childhood turned into a total deadlock standstill with no vehicles moving. It was bitterly cold. Hitler was in his Mercedes behind the stalled vehicles. However, Austria was then under the control of a raving lunatic, and the Austrian people along the way cheered. 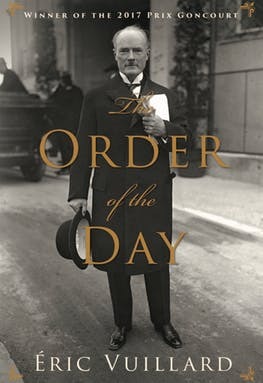 ‘The Order of the Day’ is very fine as an indignant look back at crucial events in modern history, but I am still not sure it qualifies as fiction.